Intel's Core i7-8086K processor is on the test bench today at Tom's Hardware. Paul does some of the best CPU reviews in the business, head on over and give his review a read. Intel's 8086, the company's first processor to use its ubiquitous x86 instruction set architecture, debuted on June 8, 1978. Forty years later and by some stroke of fortuitous timing, Intel's desktop CPU portfolio is loaded with eighth-generation Core processors. 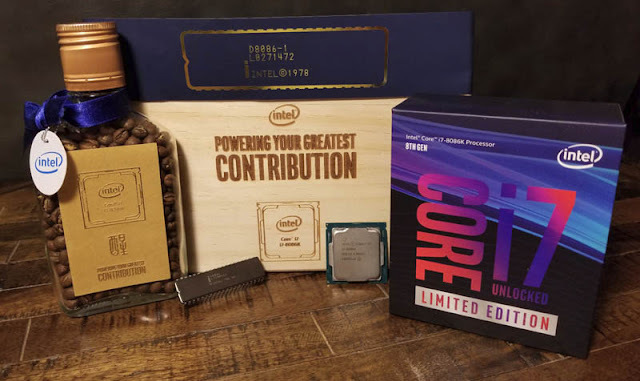 So it was only fitting, then, that after a bit of prodding by a well-known chip analyst, Intel announced that it'd pay homage to the 8086 with a 40th-anniversary limited-edition Core i7-8086K.